The theme of this year’s International Migratory Bird Day is unity. The Smithsonian has a longstanding history of commitment to the natural world. No figure in the Institution’s history better exemplifies the theme of unity surrounding migratory species than sixth Smithsonian Secretary and ornithologist Alexander Wetmore. He knew the importance of the role that birds play in our ecosystem. Whether it is creating natural biodiversity by dispersing seeds, the pollination of plants, or by providing the prefect natural soundtrack, birds are paramount to the health of our environment. 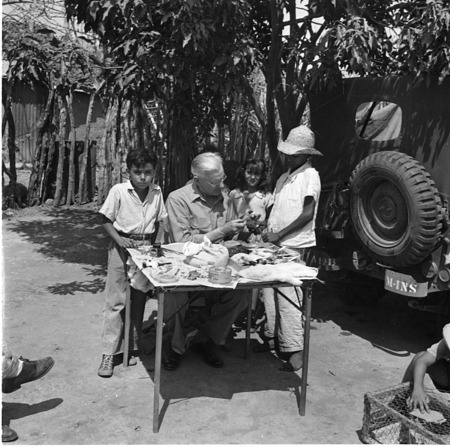 Wetmore made the conservation of migratory species, including birds, a priority of his tenure. He joined with our South American neighbors and created international partnerships protecting birds, and was instrumental in growing the Smithsonian’s tropical biology research. As we mark International Migratory Bird Day this Saturday, we are looking back on the Smithsonian’s commitment to migratory birds, but are working to carry on the legacy of Secretary Wetmore, and all of the early naturalists who laid the foundation for conservation-focused holidays. At the Smithsonian Institution Archives, we are doing our part by working to grow the collective sphere of knowledge on birds. This is being accomplished through one of the Smithsonian’s greatest tools for unifying history and science-minded folks from around the world; our crowdsourcing platform, the Transcription Center. This month, the Archives will start to release the Annual Curator’s Reports from the Smithsonian U.S. National Museum’s Department of Birds. These in-depth and strikingly detailed reports document each specimen accessioned by the department. We are starting in 1889, where head curator Robert Ridgway notes the slowdown of new specimens acquired by the museum, and that it is not necessarily a bad thing. You never know what gems you may find, and you could perhaps be the very first person to read them in over 125 years. Happy International Migratory Bird Day and of course, happy transcribing!